Note: As explained in this post, in honor of me and my wife’s first year of marriage, I’m going to spend the second year posting monthly reflections of the same month a year earlier. This is the tenth installment. May in the Willamette Valley pours out in a mix of bright, summer-ready days, damp-but-mild spring afternoons, and a good solid dose of cool, even cold weather. Summer is both right around the corner, and yet a long way off. The plum tree blossoms spring out early, and by mid-May at the latest, they’re usually gone, but for a few brief weeks, whites and pinks will leap out from amongst the greenery of front yards and parks, a reminder that brighter days are around the corner. 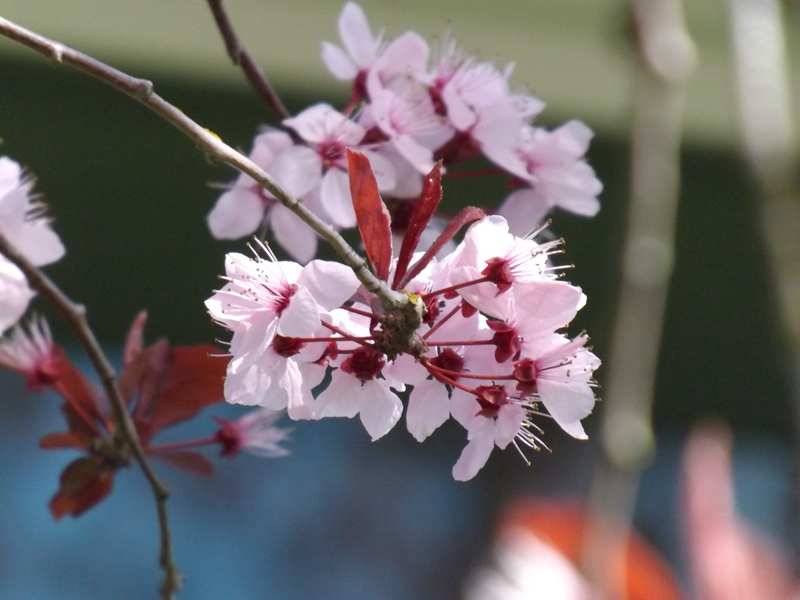 Last May, despite the last petals of the plum tree blossoming in our front yard and the spring buds rising in the garden out back, my attention was focused elsewhere. Instead, I was hearing music (in more ways than I knew at the time… but part of that will have to wait for June). May was the month that I had the unforgettable joy of watching you take center stage at the symphony and perform Berlioz’ Harold in Italy solo, in front of the community that has come to rightfully admire your playing, in front of those of your family who were able to travel thousands of miles to attend, in front of other friends and acquaintances who were also there. It was a wonderful performance, as everyone agreed… but I have to confess, I remember little of the music itself. What stands out to me in particular from that evening is the intensity of my pride in you at that moment, because I knew how hard you had worked and how much had been sacrificed for you to get to that moment. Pride, and more than a little joy at seeing your skill and dedication receiving much-deserved recognition. Pride, joy… but perhaps mostly awe, for thinking of how incredibly fortunate I was to be able to experience that moment. There are many little moments that comprise the constellation forming the “beginning” of our relationship, some of which I have discussed in earlier entries. One of the more significant moments came in that same concert hall, while I was attending a concert with a very close mutual friend (later to officiate at our wedding), when I sat in the upper balcony and listened to the performance. I had not attended a great many symphony performances prior to that night, but I had long enjoyed orchestral music, and it seemed a very great and powerful thing, that night, to sit and enjoy the performance. Over the years that followed, as so much of our lives and relationship folded around music and your performances in particular, I thought back to that first night, and the quiet, graceful feeling I recalled of thinking how wonderful it would be to live a life filled with music. As someone who has always loved music but has difficulty learning the fundamentals of playing a kazoo, I thought that it must be something exquisite to be constantly surrounded by strains of Bach and Beethoven and Adams (well, I didn’t really know about John Adams quite yet, but I learned quickly). Over the years that followed, I found myself in the symphony hall at nearly every symphony concert, and as our relationship unfolded, so too did my understanding and appreciation for the depth of skill and knowledge required for each performance. The symphony hall moved from seeming to be an almost sacred space to a familiar, welcome place; I enjoyed chance encounters with various faculty members from my department, the patriarchs and matriarchs and even scions of “old” area families, gruff but endearing widowers and, on occasion, various spouses and partners of other symphony members. Sometimes I sat right in front, an arm’s length away from the stage; others I found myself back up in the furthest reaches of the hall, squinting to see the performers. But wherever I sat, the music was always there — and so were you. No matter how much I enjoyed the music, I always found myself reflecting on the fact that I would not be there, much less appreciate and understand what I was experiencing, had I not met you. And last May, when you marched out onto the stage and took up your position, my thoughts swept through all those prior nights at the symphony, and the way I had found a portal into a world I never envisioned becoming a part of, and I thought of how incredibly fortunate I have been to have you for a friend and partner. Not because I get to attend the symphony on a regular basis (it’s a nice perk, I’ll admit!) but because our life together has led to adventures and experiences and people and places that I never could have envisioned being a part of. Thank you, HP — for the music, and for everything!